Lewis "Lew" Wallace was a lawyer, governor, Union general in the American Civil War, American statesman, and author, best remembered for his historical novel Ben-Hur: A Tale of the Christ. 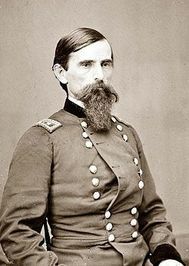 Although he would have much preferred to be remembered as a highly successful military hero, Lew Wallace has been thwarted in this ambition and is best known as an author. Born in Indiana, he had worked as a clerk and early displayed a fascination for Mexico which would affect him in later years. During the Mexican War he served as a second lieutenant in the lst Indiana but saw only minor action. In 1849 he was admitted to the bar in his native state and seven years later entered the state senate. With the outbreak of the Civil War Lewis "Lew" Wallace was a lawyer, governor, Union general in the American Civil War, American statesman, and author, best remembered for his historical novel Ben-Hur: A Tale of the Christ. With the outbreak of the Civil War he offered his services, and his assignments included: adjutant general of Indiana (April 1861); colonel, 11th Indiana (April 25, 1861); colonel, 11th Indiana (reorganized August 31, 1861); brigadier general, USV (September 3, 1861); commanding 3rd Division, District of Cairo, Department of the Missouri (February 14-17, 1862); major general, USV (March 21, 1862); commanding 3rd Division, Army of the Tennessee (February 17-June 1862); commanding 8th Corps, Middle Department (March 22, 1864-February 1,1865 and April 19-August 1, 1865); and also commanding the department (March 22, 1864-February 1,1865 and April 19-June 27, 1865). His career got off to a promising start when he routed an inferior Confederate force at Romney, Virginia. Promoted to brigadier general, he was given charge of a newly organized division in the midst of the operations against Fort Donelson and was soon rewarded with a second star. However, that spring his reputation plummeted after the battle of Shiloh. On the first day his division was stationed north of the main army at Crump's Landing, and a series of contradictory orders from Grant forced him to countermarch his command and delayed his arrival on the main battlefield until the fighting was nearly over. He redeemed himself on the second day, but a scapegoat was needed for the near disaster the day before and this was Wallace. Sent home to await further orders, he offered his services to Indiana Governor Oliver P. Morton and, despite his high rank, took temporary command of a regiment during the emergency posed by Kirby Smith's invasion of Kentucky. With Cincinnati threatened, Wallace was placed in charge of a mostly civilian defense force. Through a show of tremendous energy he was able to save the city without a major fight. He was then head of the commission which examined Buell's handling of the invasion and other boards until placed in charge in Maryland in early 1864. There he bought valuable time for the defenders of Washington during Early's drive into the state when he made a stand at Monocacy with an inferior scratch force.